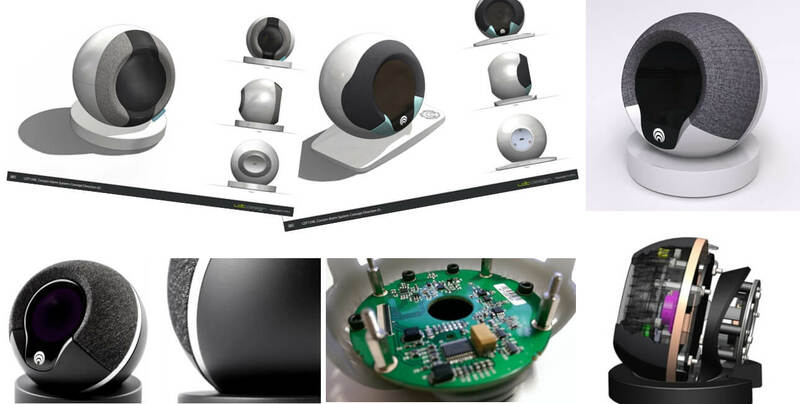 LDT Design, a Design Network North member, and Cocoon Labs have come together to develop Cocoon, a home alarm device that is affordable, unobtrusive and aesthetically pleasing. Cocoon is able to track movement from inside the entire home, and can alert you by phone if it detects anything untoward. Frustrated with the consumer alarm market, Cocoon Labs started working on their own alarm – ensuring it was easy to operate and modern, with its own smartphone app. They began working on the Cocoon’s unique subsoundR hardware system which, unlike other home alarms, makes it possible for the alarm to be left in one single position in the home, yet able to monitor the entire house. Once they had finished working on some of the other vital software, such as the Cocoon’s infrared microphone, geolocation software and machine learning algorithms, they were on the look-out for a product designer. LDT Design, product design and development company based in York, were Cocoon Labs’ first choice. Having had eight years’ experience in the field, and an impressive portfolio, Cocoon Labs knew they could rely on LDT Design to bring their concept to life. The brief involved developing the aesthetics to make it a welcome addition to a consumer’s home, and to develop product enclosure capable of protecting the hardware. The product went through six major stages of development before it was commissioned for manufacture in December 2015. The first phase of work involved developing aesthetics whilst defining a realistic space envelope for the electronic hardware. LDT Design also ensured that the concepts they created would be capable of being manufactured in volume production. A major development in phase one was the application of fabric to the front of the Cocoon. LDT Design felt it was important to soften the appearance of the product, so it would fit seamlessly into a typical living room. This involved working very closely with the manufacturer of the Cocoon’s enclosure to understand how to reliably apply the fabric to the polymer substrate. A third and challenging phase of development was the creation and integration of an acoustic chamber. LDT Design worked alongside an acoustic engineer to define and seal chambers, ensuring maximum sound quality for consumers. During testing, it became apparent that the Cocoon needed to be able to cool down. The microprocessor in the unit was causing a large amount of heat, but LDT Design were able to introduce an aluminium heat spreader plate and ventilation apertures without affecting the aesthetics of the Cocoon. After 18 months of product testing and development, LDT Design and Cocoon Labs produced a home safety device that is both attractive and utilises state-of-the-art technology. Its appearance is as unique as the combination of technology within it. Unsurprisingly, Cocoon has been very well received by the market place, with Cocoon Labs’ crowdfunding campaign on Indiegogo far exceeding their initial target by more than double. Cocoon Labs also secured a $3M seed investment from Aviva Ventures (LON:AV) and Breed Reply Investments (BIT:REY). This added to the earlier investment from Breed Reply Investments of $1.3M which came just after Cocoon Labs’ successful Indiegogo campaign, supporting their vision of enabling people to seamlessly protect the most important place in their life. Receiving media attention from the likes of the Telegraph, The Guardian, Cnet and TechCrunch to name a few, Cocoon Labs are enjoying great success with their product with no sign of slowing down. Design Network North is part of RTC’s new programme called ‘Designing Better Business’ – launched in 2016 - which will provide support for north east businesses looking to continue to innovate and design better world leading products. RTC was founded in 1989 with the sole purpose of helping businesses innovate and create new higher value products. Today, the business operates out of offices in Sunderland, Gateshead, Leeds and Daresbury and specialises in helping companies develop new products, embed new skills through training and access funding for innovation. ‘Designing Better Business’ is part funded by European Regional Development Fund, as part of the European Structural and Investment Funds Growth Programme 2014-2020.